Tar sands is the oil industry’s newest threat. 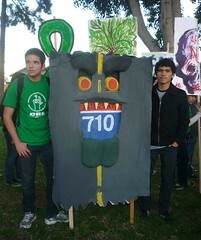 Local activists want to put limits on refinery emissions to halt this dense and dangerous crude from coming to the Bay. But are the regional air district and state government on board? 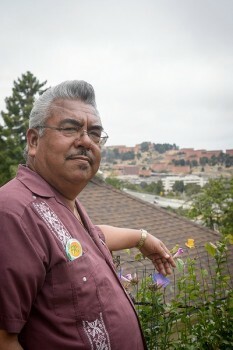 While growing up in San Pablo during the 1960s, Andres Soto would wander to an area of his neighborhood that overlooked Richmond’s oil refinery: a colossal system of pipes, towers, and smokestacks perched on a peninsula of low hills rising from the Bay. He could see a pulsating light in the night sky, and also a towering flame streaming from the refinery stacks like a fiery monster. The oil giant, now called Chevron, was burning off unwanted chemicals that accumulate from processing crude petroleum into gasoline and other products — a practice called “flaring.” For days afterward, heavy black smoke blanketed Soto’s hometown. Health problems have plagued Soto and his family. His youngest brother succumbed to brain cancer at the age of three. His other brother developed tongue cancer in his thirties, despite having abstained from smoking and heavy drinking. Soto and his two sisters suffer from adult-onset psoriasis, an autoimmune disorder that attacks the skin’s surface. The condition also beset their parents. Today, Soto is an organizer with Communities for a Better Environment, an environmental-justice organization at the forefront of the fight against the California oil industry. Since 2013, oil corporations have intensified a push to bring more polluting fuel sources to the Bay Area and other West Coast oil-production centers, in particular hydro-fracked Bakken shale oil from the Dakotas and Montana, and the Canadian tar sands, a sticky mixture of sand, clay, and bitumen trapped deep beneath Canada’s boreal forest. Numerous experts have cautioned that greenhouse-gas emissions, or GHGs, from expanded tar-sands production would lock in dramatic increases in global temperatures — with devastating impacts to ecosystems and communities both here in the East Bay and globally. “California has become the biggest and most important battleground in the tar-sands fight,” observed CBE senior scientist and longtime refinery expert Greg Karras. Increased tar-sands production would spike local refineries’ emissions of the heat-trapping chemicals that fuel climate change. It also would release greater quantities of pollutants into the predominantly low-income communities of color immediately downwind of the five refineries in Contra Costa and Solano counties. Already, oil processing is the Bay Area’s largest industrial source of toxic contamination and lung-penetrating particulate matter, making it a major cause of asthma, cancers, and other maladies. 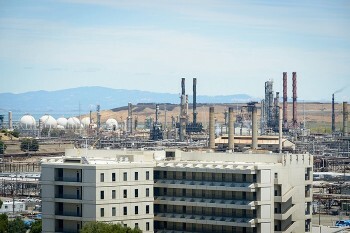 As a means of preventing a so-called “West Coast tar sands invasion,” CBE and a coalition of other local groups have proposed that the Bay Area Air Quality Management District quickly impose quantitative limits, or “caps,” on regional refinery emissions of GHG, toxins, and ultra-fine particulate matter. But officials at BAAQMD and the California Air Resources Board have opposed these blanket caps, saying the plan would simply push GHG emissions to other parts of California. They have even said the caps would interfere with the state’s effort to combat global climate change, through its cap-and-trade program — a stance shared by the oil industry. Soto, Karras, and other advocates assert the opposite. They say the refinery caps are a necessary means to protect local residents and refinery workers, and also to head off the catastrophic impacts of global warming. The stakes are high. “If the tar sands proceed on the scale the industry intends globally, you can kiss the climate good-bye,” Karras said. The Bay Area has been a major oil-refining region for more than a century. In 1881, the Pacific Coast Oil Company opened California’s first refinery on the island of Alameda. The company went on to become Chevron, rated by Forbes as the world’s sixteenth wealthiest corporation. In 2014, the Bay Area’s five refineries, including Chevron’s flagship Richmond facility, processed an average of 754,000 barrels of oil per day, or 45.5 percent of California’s total production, into gasoline, jet fuel, propane, and other products. The Golden State, in spite of its reputation as a haven for environmentalism, is the third-leading oil producer in the United States, much of it exported to surrounding states. Today, a little more than 8 percent of oil produced in this country comes from the tar sands. Due to opposition to the Keystone XL pipeline, however, the tar-sands industry has been unable to expand its production in the Louisiana-Texas Gulf Coast for several years. Meanwhile, some of California’s main petroleum sources — including the oil fields in Kern County and on Alaska’s north slope — are in decline. Similar to the tar sands, many of these existing crudes are uniquely dense. In turn, California refineries have developed a unique technical capacity to process heavier crudes. Industry experts have said it may be up to the West Coast to provide the refining infrastructure to handle the tar sands’ specialized production requirements on a significantly increased scale. But tar-sands bitumen causes more climate pollution at all stages, from extraction to refining, than virtually any other fuel source. It requires enormous levels of energy to process into usable products. It also leaves behind large quantities of petcoke, the only fossil fuel the Environmental Protection Agency regards as dirtier than coal. The tar sands also contain high concentrations of toxic metals, chemicals, and sulfur, which corrodes pipes and could lead to increased explosions, local residents fear. Currently, numerous tar-sands-related projects are working their way through regulatory processes. Valero intends to bring large volumes of tar-sands crude into the Bay Area and Los Angeles via 100-car oil tanker trains. Phillips 66 already receives a comparatively small volume of tar sands via an elaborate delivery system. The company is now also proposing a Northern California crude-by-rail project. Other possible projects include a Bakersfield rail hub that would bring tar-sands crude to existing California pipelines. Chevron has already completed a tar-sands-oriented expansion, although opposition by CBE and other groups forced a significant scale-back. In response to this threat of ramped-up oil-industry pollution emanating from the East Bay, a coalition of environmentalists — including 350 Bay Area, the Sierra Club, Asian Pacific Environmental Network, CBE, the Sunflower Alliance, and Steelworkers Union Local 5 — have pushed for “caps” on regional emissions since 2012, as a step toward deeper local cuts. After a couple years, the coalition seemed to achieve a breakthrough, when the supervisors and city councilmembers from nine counties that make up the BAAQMD board of directors unanimously passed a resolution directing staff to achieve 20 percent reductions for various types of refinery pollution. Corey’s reasoning is tied to California’s cap-and-trade system, which allows companies that lower emissions to sell pollution “allowances,” which let other companies increase emissions. In addition to “allowances,” California’s version of cap-and-trade lets companies avoid regional pollution reductions by purchasing a certain number of “offsets” from carbon-saving projects elsewhere in the United States or in Quebec. This means that, if a local company increased its emissions through full-tilt tar-sands processing, it could simply purchase additional “allowances” in California and “offsets” elsewhere in North America. Chevron provides a case in point: The company was California’s second-largest greenhouse-gas emitter in 2013, according to CARB data. But it was also the largest purchaser of offsets during the cap-and-trade program’s inaugural two years, 2013 and 2014, according to a recent study by the Oakland-based California Environmental Justice Alliance. Tesoro and Valero were not far behind. The company has used forests in Maine, Michigan, South Carolina, Willits and Humboldt County — and an Arkansas-based project to destroy ozone-depleting substances — to offset its pollution, which mainly occurs in Richmond, El Segundo, and Kern County. As a result, its emissions of toxins in these places were undiminished. But regional-caps proponents have labeled this argument an excuse for doing nothing. They point out that the state Legislature has gone beyond cap-and-trade with various policies to reduce emissions. For example, 2015’s Senate Bill 350 mandates that 50 percent of electricity generation in California come from renewable sources by 2030. Environmental-justice groups have long criticized cap-and-trade programs as cheap ways for major polluters to buy their way out of achieving emissions reductions. Those living alongside polluters tend to favor tight regulations on GHG emissions at the source as a means of achieving blanket reductions of these unregulated toxins. 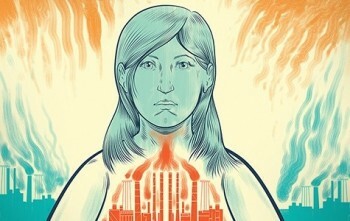 This environmental justice movement dates to the early 1980s, when Black leaders from the Civil Rights era began calling attention to the triple whammy of race, poverty, and environment, citing how low-income communities of color overwhelmingly are more likely to live near pollution sources than affluent populations. The Legislature has noted the moral imperative of addressing environmental-justice groups’ concerns. It has also acknowledged the practical necessity of mobilizing their support for its climate policies, which are subject to unrelenting attacks from fossil-fuel industries. 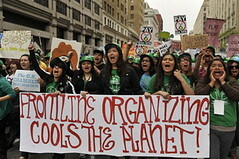 The 2006 Global Warming Solutions Act, also known as Assembly Bill 32, not only mandated that the state reduce emissions by 20 percent, relative to 2005 levels, by 2020, but also directed state agencies to achieve “co-benefits” on behalf of those most burdened by fossil fuel-related pollution. 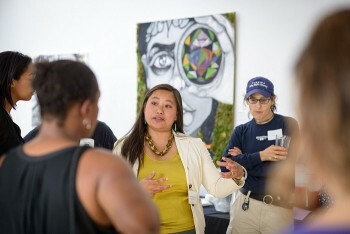 In keeping with this mandate, CARB established an Environmental Justice Advisory Committee. However, current and former EJAC members have shared with the Express their deep frustration with CARB leadership, who they say has completely ignored their proposals. Instead of providing “co-benefits” to environmental-justice constituencies through direct pollution reductions, the state has agreed to share cap-and-trade’s spoils with them. In 2012, Senate Bill 535 stipulated that at least 25 percent of revenues from cap-and-trade permit fees need to be invested in projects that guarantee emissions reductions and benefits for socioeconomically disadvantaged communities. But advocates for regional caps say local governments should have the ability to go beyond cap-and-trade. “If we have the will locally to do more, we should do it,” activist Soto said. In 2012, a crack in a steel pipe at Chevron’s Richmond refinery caused a fireball to ignite inside the facility. Nineteen workers narrowly escaped. A toxic plume spread over Richmond and San Pablo, prompting 15,000 residents to seek medical treatment. The U.S. Chemical Safety Board later ruled the major cause of the explosion was the refinery’s reliance on oil with high sulfur content, which caused rapid corrosion of the pipe. Tar sands contain even more toxic metals and chemicals than Chevron’s existing crude sources, as well as higher concentrations of sulfur, according to the BAAQMD — and with it the threat of more frequent spills, fires, and explosions, proponents of the regional caps argue. In response to the incident, BAAQMD adopted a set of regulations. Last year, mainly at the prompting of 350 Bay Area and the Sierra Club, the air district also took several steps to rein in GHGs. It has even committed to reducing the GHG emissions in its jurisdiction by 80 percent by 2050. But many activists contend that air-district staffers have attempted to thwart consideration of local emissions caps because they’re too cozy with oil corporations. BAAQMD’s advisory council, a seven-member expert panel that consults with the board of directors and the executive officer on technical and policy matters, has also opposed the emissions caps. The council’s members are largely selected by BAAQMD executive staff. Advisory Council Chairman Stan Hayes has said at recent meetings that he agrees with the goal of reducing greenhouse-gas emissions, but that regional refinery caps would simply lead to “a game of climate change Wack-a-Mole,” where one area swats down emissions and then they pop up somewhere else. While Hayes has an extensive scientific background, he also has worked as a consultant to the oil industry. During a long tenure as a principal of the environmental consulting firm Environ International, his clients included the American Petroleum Institute, the country’s largest oil-industry lobbying organization, and the Western States Petroleum Association. In 2005, for example, he lobbied against stronger regulations that CARB was considering on emissions of ozone — a greenhouse gas. Environ International has consulted with businesses on how to benefit financially from carbon-trading programs, including California’s cap-and-trade system, via a company division called CarbonVentures. In 2003, Hayes co-authored an engineering trade journal article titled “Profit From Effective Greenhouse Gas Management — A Six-Step Plan,” which advised companies on how to “realize the benefits of available opportunities and to gain competitive advantage” from carbon trading. Hayes told the Express that he has “been really candid” with BAAQMD Deputy Director Jeff McKay regarding his work for the oil industry. But he declined to discuss whether he considers such work a conflict of interest. The oil industry has been lobbying hard against the regional caps. In April, an organization called the Committee for Industrial Safety — bankrolled by oil giants Chevron, Shell, Tesoro and Phillips 66 — even sent a suspicious mailer to an unknown number of households in the Bay Area, targeting BAAQMD board-member voter districts. The mailer claimed to be from a group called Bay Area Refinery Workers, and included signatures from twelve refinery employees, who called for a vote against new oil-industry regulations in the name of economic justice. According to state and federal records, each corporation annually provides the lobbying group between $100,000 and $200,000 to advocate on their behalf. Contra Costa County Supervisor and environmentalist John Gioia is an influential representative on the BAAQMD board of directors, as well as the Bay Area’s representative to the CARB board of directors. At a June 1 BAAQMD committee meeting, he noted that it has become well-known in Sacramento that the oil industry may attempt to pass legislation to strip GHG regulation authority from local air districts in response to BAAQMD’s new and proposed measures. The oil industry spent more than $23 million lobbying California legislators in 2015 alone, according to data on the California secretary of state’s website. On June 15, BAAQMD’s directors convened a much-anticipated meeting inside their new Beale Street headquarters at the edge of San Francisco’s Financial District. More than one-hundred people attended, including many of the oil-industry employees who had signed the Bay Area Refinery Workers letter. One of the afternoon’s most interesting public comments, however, came from Mike Smith, of Steelworkers Union 5, which represents 80 percent of employees at three of the Bay Area’s refineries. In contrast to the industry mailer, he expressed the union’s support for emission caps. “People used to call us the Bay Area Refinery Workers, but I guess someone else has claimed that name,” he said, joking, before stating that the caps would also help the refineries become safer workplaces. “We have to protect this world, and you are one of few places where change can happen,” said Amy Valens, a retired teacher from the 350 Marin climate-change group. Oakland Councilmember Rebecca Kaplan is the city’s representative on the air district board, and she gave comfort to cap proponents by speaking critically about the oil industry’s push to refine dirtier fuels. Earlier at the meeting, BAAQMD executive director Broadbent repeated the claim that a regional emissions caps would send refinery production elsewhere and that it would not achieve an overall reduction in emissions. As an alternative to the cap, he proposed a more selective regulatory structure using the cost-effective, technological retrofits of specific refinery equipment so as to control and reduce their emissions, known as the Best Available Retrofit Control Technology method. Broadbent planned to bring the matter up for a vote by December, but some BAAQMD board members requested that the vote occur sooner. San Francisco Supervisor John Avalos insisted that Broadbent return to the next BAAQMD meeting in July with a timetable for implementation of a cap proposal, and that his staff prepare an environmental-impact review of the idea as soon as possible. Avalos has been a persistent advocate of caps, in part owing to his own personal experience with the oil industry. Growing up in the southern Los Angeles town of Wilmington, he lived close to several refineries. One of his earliest memories, he says, is of an explosion at the Wilmington Texaco refinery, which blanketed his town with pollution and was met by false promises from company officials that such incidents would never occur again. Only a few years ago, the oil industry was pushing ahead with projects like the Keystone XL pipeline, and the Northern Gateway pipeline through British Columbia, which would have enabled delivery of enormous volumes of the high-carbon crude to the West Coast. But grassroots opposition to Keystone XL led President Barack Obama to veto the project in 2015. And determined opposition by some of the most systematically disenfranchised people in North America — Canada’s indigenous people — has been the main obstacle to the Northern Gateway’s completion. As a result, the tar sands are effectively landlocked, and the oil industry has been forced into their current efforts to ship smaller quantities of this carbon-intensive product by rail. A 2015 report in the journal Nature found that trillions of dollars’ worth of known and extractable coal, oil, and gas reserves — including nearly all remaining tar sands and all Arctic oil and gas — must remain in the ground if global temperatures are to be kept under the safety threshold of 2 degrees centigrade, agreed to by the world’s nations. And that’s why proponents of the emission caps — led by those most directly poisoned by oil refineries — see this prospective new regulation as a crucial piece of an international grassroots struggle to fight climate change and starve the tar-sands beast. 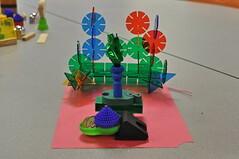 This entry was posted in In the News by Sylvia. Bookmark the permalink.